ZOC are the new assist hooks for light tackle and deep area where hooking power can be difficult to transmit to the hook point. 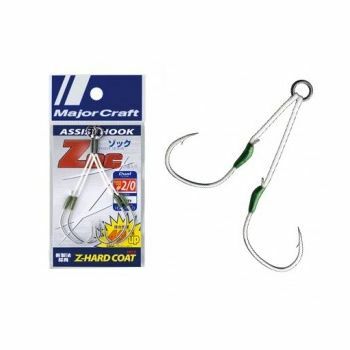 The new ZOC hooks are super sharp and catch the fish! ! Designed to withstand actual fishing, the setup is reduced in weight by using thinner stronger material. Major Craft successfully succeeded in coating the thread with the same high-altitude resin used for guide wrapping of rod (Z-HARD COAT), this lightens the connection, reduces water resistance and improves durability compared to conventional shrink tube . Assist line length appropriate for your jig It prevents snagging on to the jig and improves hooking rate. Length is set in mm and represents the drop length to each hook. The HT model is an outward facing hook pairing.